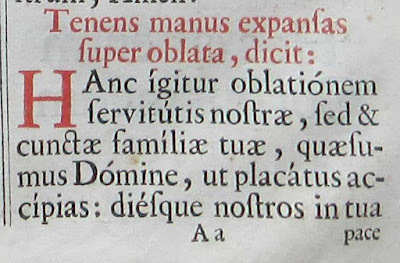 One of the oldest missals, if not the oldest, that the Benedictine Monks of Perpetual Adoration at Silverstream Priory have in their possession is this lavish volume from 1716, the title page of which clearly proclaims that it is a Roman Missal with all the feasts proper to the order of Augustinian hermits. 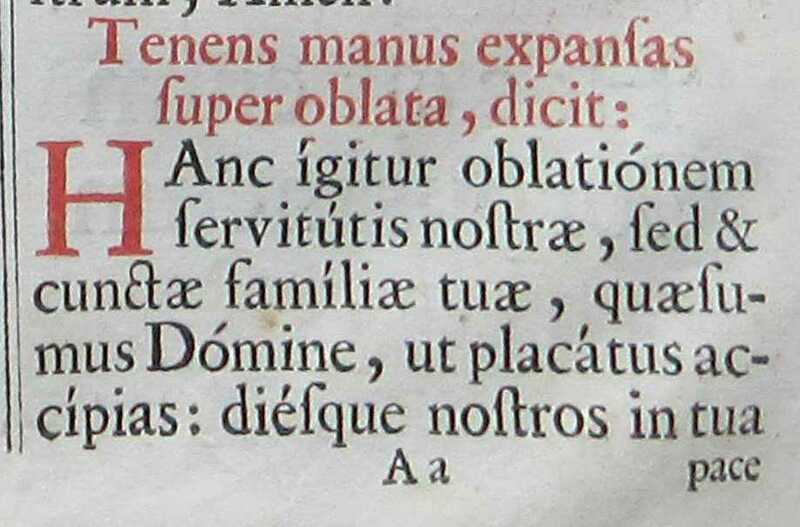 As is typical with books of this period, the artwork is monochromatic, while the text features red rubrics (that’s a redundancy of course!) and red capitals. The book is in excellent shape given that it is exactly 300 years old. As with all books from this period, we see the charming custom of the first word of the next page printed at the bottom of the preceding page, to aid in smooth reading transition. The cover is quite something, too, with its velvet fabric, embossed metal decorations, and clasps. No detail has been overlooked: the edge of the book is fancifully ornamented with pin-pricks into the pages to form swirls. Looking at a book like this makes me wonder when enterprising bishops will once again begin to commission fine artists to produce hand-made and hand-illustrated missals for pontifical liturgies, or when priests will start to commission Requiem missals, etc. The time has come to revive the art of the book, precisely in honor of the most holy and august Sacrament of the Altar — and not in the St. John’s Bible style, with its pretty penmanship but ugly graphics, but in the grand tradition of such books as this Augustinian missal or the illuminated missals of the Middle Ages. Why should we settle for plain, mass-produced books, when we could squander sums of wealth, rare talents, and forces of intelligence and love on unique volumes that will be a sort of solid equivalent of the clouds of incense we burn up solely for the glory of the Lord?